(KPL) The European Union Ambassador to the Lao PDR Léon Paul Faber, the Minister of Commerce and Industry Khemmany Pholsena and EIF Executive Director Ratnakar Adhikari launched on Mar 11 the strategic plan 2019-2022 of the Enhanced Integrated Framework (EIF): Forging New Paths for Least Developed Countries in global and regional trade. The plan aims to empower Laos to use trade and investment in order to integrate into the global trade for sustainable development and poverty reduction. Targeting sectors in three northern Lao PDR provinces where improvements would directly increase incomes for poor households and especially women, the US$1.8 million investment will focus on increasing productivity of agribusinesses and handicrafts, supporting local enterprises by removing existing barriers to business and enhancing public-private dialogue. “The EU, as a reliable multilateral partner, reaffirmed our commitment to working closely with the Lao government to improve the trade environment of the country for a better inclusion and sustainable growth,” the European Union Delegation in Laos posted on its facebook page. “The project forms part of the third generation of our long partnership with EIF and aims to support the government’s vision for trade and private sector development: enhancing the competitiveness of Lao enterprises, improving the business enabling environment and economic integration under the World Trade Organisation and the Association of Southeast Asian Nations,” said MOIC Minister Khemmani Pholsena at the launch in Luang Prabang. Following research on agriculture and supply chain needs, the predominantly highland provinces of Luang Namtha, Oudomxay and Phongsaly were selected because of the limited off-farm opportunities and high levels of poverty. Agribusinesses in Luang Namtha’s rice sector, Oudomxay’s maize and Phongsaly’s tea will be targeted with the aim to improve agricultural production and expand market orientation – and based on emerging opportunities with nearby countries. Interventions will include crop-specific trainings and making the needed connections between rural farmers, agribusinesses and markets. The project also aims to support at least 200 households that work with handicrafts in those provinces, with 60% of those to be impacted women. “We are pleased to partner with the government on such an important effort that responds to the country’s national development plan and follows from years of impactful work together to support inclusive trade. 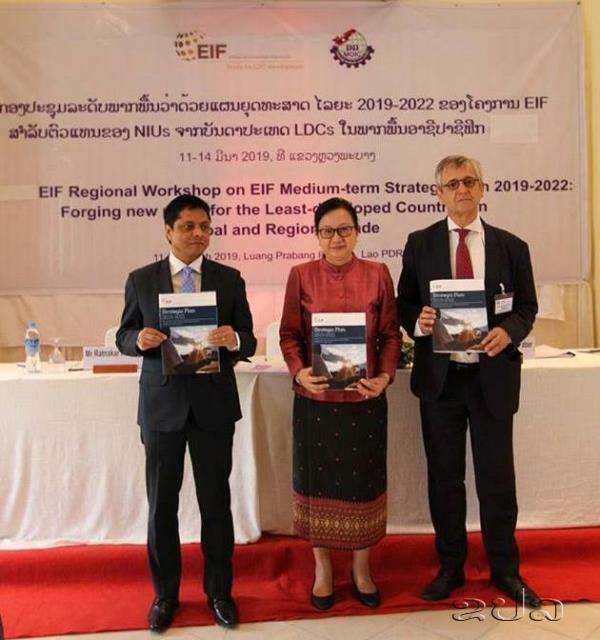 With simplified procedures for new businesses as well as lower trade costs, we aim for Lao PDR’s small enterprises to thrive,” said EIF Executive Director Ratnakar Adhikari.